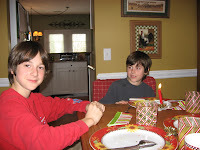 When we first moved to Charlotte, I had no friends. But I did have a little hope that one day I'd find at least one. You see, before we moved from Virginia, my mom mailed me an article she'd seen in the newspaper about some women in Charlotte, NC who were college graduates that decided to be stay-at-home moms and start a ministry to encourage other SAHMs. My mom didn't even live in Charlotte. The Sunday newspaper had somehow ended up in her driveway one morning and she found the story in the family section. She knew we were moving here so she cut it out and put a sticky note on the front page that said, "These sound like the kind of friends you need. I hope you find them when you get to Charlotte." My heart was especially drawn to one of the women in the article. She and her husband owned a Chick-fil-A and she was expecting a baby in May. I had worked at Chick-fil-A in high school and I was pregnant with our first child due in May. I thought, with these two things in common surely it must be a sign that we could be friends. I decided that I shouldn't wait until we got to Charlotte to find this friend. We would be moving there in a few months and we still needed to find an apartment, a pediatrician and a church. So I picked up the phone and called information for the home number of the TerKeurst family. I still can't believe I did that. Lysa answered the phone and I blabbered the whole story - I am sure that I even mentioned working at CFA in high school. How pitiful! Surely she thought I was some lunatic! But she didn't show it. She was so sweet and offered the name of her pediatrician, suggested some areas of Charlotte to consider for apartments and encouraged me to call her when we got to town. 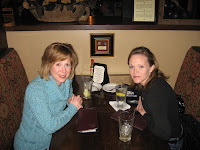 A few weeks after we moved to Charlotte, I called Lysa and she invited me to meet her for lunch at Chick-fil-A. I remember driving down the road and seeing the CFA sign. I got nervous and started praying, "Lord, please let this be someone I can be friends with. I am so lonely staying home with a baby and not knowing anyone in this big city. I need a good friend. Please make me seem like the kind of person she'd want to be friends with." I felt so insecure. I had so little to offer to this woman who was part of leading a ministry and probably had a gazillion friends. That day as I prayed for God to give me a friend His Spirit whispered to my heart that instead of praying to have a good friend, He wanted me to pray that I could be a good friend, to her. As Lysa and I ate chicken nuggets and sipped sweet tea, I remember thinking how fun she was. Her daughter Hope was so cute and our newborns looked like twins. Ashley and Joshua had come into the world only a week apart. They both had lots of brown hair and beautiful big brown eyes. Our cute kids gave us lots to talk about, but I still doubted she'd have any need for a new friend. She seemed to have everything a woman could want. Even so, I was thankful that even if it was just for that day, God had given me the gift of some time with a friend. After lunch, Lysa invited me to her home for the afternoon. We ended up spending the whole day together, and most of the time I was bent over laughing with pains in my side and tears rolling down my face. She shared some of her funniest motherhood stories, one of which included something about an infection that wouldn't heal and the need for a heat lamp, which she didn't own. Instead she used a table lamp and her inner thighs got "lamp-burned" from the intense heat. All the while she was trying to nurse a newborn and appease a very active 1 year old. By this point I was thinking, maybe I do have something to offer to this poor woman- bless her heart! That day was the beginning of a life-long friendship. Our babies will be thirteen this May, and God's plan for our lives to be woven into friendship and ministry is simply amazing. There is so much He has taught me through our friendship. I'll share more on Friday since I am working at the P31 office all day tomorrow. I wish I could remember the details of the lamp incident. I think you deserve to know them. (I am sure it will make you laugh so hard you'll cry too). So visit Lysa on her blog today and be sure to ask her to tell you more. She's got some fun stories there about Hope who is turning 14 tomorrow! But before you go, is there anything fun you'd like to know about our friendship? If not leave a comment about how you met one of your good friends. I'd love to hear about it! Thanks to all of you who came by this past week and hung out with me so we could talk about friendships. I love girl-talk about stuff women don't usually discuss - like comparison, compulsive email checking, wanting friends but wondering if anyone else would want to be your friend, the challenge of making/finding time for friends, etc. I used to think I was the only one who thought that way I do, felt the way I do and acted the way I do. I think that is why God called me to be a speaker, 'cause He knew that by talking about it all, I'd find out we women are so much alike it's not even funny. Well, you have convinced me that I am pretty normal - and that is a good feeling! I was talking with a friend this weekend about the comparison thing and the comments on my blog. She said she just wanted to pick up the phone and call April to invite her over for coffee since she could empathize with what she shared. She just knew they could be good friends. I love what happens in our hearts when we find out we are not alone, that we all struggle in some way or another with the same things. It's the very thing that connects our hearts to each other. It also weakens the power of insecurity or comparison when we just put it out there and are willing to be honest with ourselves and each other. Well, I am not ready to move on to a different topic. I don't feel God giving me the go-ahead. I just have too much I need to ponder on this friendship thing, and more of my heart I really want to share. I also want to read through your comments again and again, (you girls posted some good stuff!) and talk more about what you shared and my thoughts on some of the questions that were asked. I am also studying Jesus' friendships so I know there is some good stuff for us to learn from Him. The One who calls us friend. Oh, and I have a story to tell you about how I met a dear friend (who many of you know), Lysa TerKeurst. It's a funny story so be sure to stop back by for more girl-talk and the inside scoop on Ms. P31 - and P is not for perfect, thank goodness! I would tell it tonight but it's 11:30pm and hubby just stopped by to tell me it's time for bed. We've been gone all day today, so I just got online but I do need to get some rest :-). Bummer, wish I could blog more. 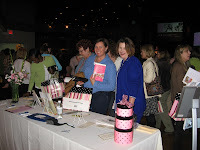 Amy Brooks and Mary Lu will be receiving a Starbucks gift card, a bracelet and a book! When we first moved to Charlotte in July 1995, we didn't know anyone. JJ had just graduated from VA Tech 6 weeks earlier, we had a newborn (Joshua) and were both starting new jobs - me at home; him at work. Here I was in a new city, looking for a new church and hoping to find some new friends. I was so lonely and felt so insecure. Charlotte is a very big, very wealthy and very busy city. There are huge churches, huge neighborhoods and lots of huge houses. Everywhere I went, women looked like they had it all together. I struggled so much with comparison and felt like no one needed a friend except me. I had only been a Christian for 6 years and was still looking through the world's lens to define what mattered most in a friendship. I had nothing to give; nothing that would make me "desirable" as a friend. I didn't know what I was doing as a mom. I needed someone to show me. I didn't know much about being a wife either. We'd only been married 18 months. I didn't even have a cute house that would be fun to host a play date. A year after we moved here, a friend told us about a sweet 1250 square foot cottage-like home in their neighborhood. It even had a one-car garage and fenced in backyard. Our first home. I loved it. I just knew I'd be content and finally be able to open my home to friends. My house was great until God gave me friends with bigger houses. I'll never forget a mutual friend introducing me to a really fun mom who had a son the same age as Joshua. 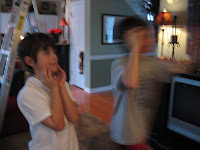 The boys became buddies and our families started hanging out together. The only problem was that her husband was a professional football player. I never wanted her to see my house because I knew it was probably the size of her garage. As you can imagine, my relationships with women were pretty "on the surface" in my late twenties and early thirties. It took me years to develop meaningful friendships. I look back now and see how all of that comparison kept me from having or being a good friend. When we compare how we feel on the inside about our selves with how someone else looks like she has it all together, we will never see the beauty of what we each have to give to each other. I am so glad God kept bringing women into my life that had much more stuff than I did, and still continues to do so. Through this process He searches my heart to see what I think matters most in a friend and challenges me to give from the riches He has stored, not in my home but in my heart. Is it just me, or do all women struggle with comparison- whether we compare our homes, our kids, our husbands, our ministries, our abilities, our weight, our wardrobe, our personality, our (you fill in the blank) ______? And doesn't it hurt our relationships with each other? Has comparison ever affected how you see yourself as a friend or how you approach those you want or don't want to be friends with? If so, how? I'll be doing my "friend-shippy" give-away this weekend. I plan to print all of the comments from this week and draw a name. So, post your thoughts on comparison and you will be entered. Simply click on the word, "Comments" below and be sure to include your email in case you win. Friends Need Grace, Grace, Grace! Update: I posted some fun family photos and a neat thing God taught me that applies to friendships...when we fail or get hurt and don't want to try again. Click here to read it. It's been one of those days. I planned to continue our conversation this morning about friendships, but one thing a girlfriend needs is grace, and today I need lots of it! My closest friends would agree. It happens ALL the time. I make plans with a friend and life interrupts...unexpected snow day that keeps kids home from school, someone gets sick, urgent need at work, etc. Well, that would be today. Girlfriend Swope woke up with a sick child who needed to stay home and emails from event planners that have been waiting since last week but gott delayed by a snow day, and two days of no school this week, parent-teacher meeting and a trip to the pricipal's office because another kid hit mine in the face. I hope as my girlfriends you can give me lots of grace; cause it's like water to me. Can't live without it!!! Oh and if you just got here, be sure to read Monday and Tuesday's post and join in the girl -talk. We want to hear your thoughts because they are a terrible thing to waste! So, be sure to share friend. I am loving all of your different perspectives. I love that you’re sharing highs and lows, ideas and struggles, and more than anything, yourself. That's a real friend. It helps those of us who may be struggling more than others can rest assured that we’re not alone – we’re not the only one who feels like they have no friends. But of course we’d never tell someone that because then they’d think we're a loser and never want to be our friend. No! That was in junior high. We’re big girls now and we were born to be friends. I want to tell you how this came up with me and God recently and how I knew He wanted to rearrange some things in my life to fill the lonely place in my heart with friends. As I shared yesterday, my schedule this past year had gotten so full with my kids (school, homework needs, adapting to different stages they are in, etc. ), investing more time in my marriage, working at P31 as an Ex Director, radio, speaking… that I had to cut back somewhere. I prayed about it and felt God’s leading me to cut back on my writing (for a season) and trim back on the amount of time I spent talking on the phone, hanging out with neighbors, and a small group I was in because I needed to be in the P31 office an extra day each week. I didn’t completely cut out my friendships, of course, but I did find my self having less and less one-on-one time with close friends for heart connects. Looking back, I probably pendulum swung a little too far, but isn’t that easy to do when you are trying to find a new place of balance? Several weeks ago I found myself checking email repeatedly. I checked it in the morning when I woke up. I made breakfast and checked it again. I had my devotional time and checked it again. I thought about it and realized that in the overwhelming busyness of life for the past several months, I had let my friendships reduce to quick connections via email. Here I was trying to fill a God-created need with a white screen and black alphabet keys. That day I closed my laptop and called one of my closest friends. She happened to be available so I took some time off work to spontaneously meet her at a coffee shop and go for a walk. Friendships are not easy to come by. Time is limited with lives that are so busy. Yet I know that God created us with this need, and He wants to meet it with Himself and others. But it takes being intentional and evaluating things in our lives like that create a false sense of connection like email, television, and overboard activities. We have to carve out a place in our lives for friendships. If you are new to my blog today, we started this conversation yesterday, so be sure to scroll down and join in this girl-talk. To make it fun, I am going to do a give-away of something "friend-shippy" like a Starbuck's card, a book and maybe some jewelry later this week. 'Cause girlfriends love to win free stuff! Please post your own thoughts about women's friendships, or today's post. Simply click the word "comments" below - and be sure to leave your email or come back this week to see if you're the winner and to keep this girl-talk going. Friends. It’s what God gave me for my birthday last week. He knew it’s what I needed most. The past year has been very busy at work and home. Something had to give and I didn’t want it to be my family, so I cut back on my social life. A lot of what I do requires that I be alone and it can be very lonely. I feel God leading me to a better place of balance in my friendships. Wouldn't you know, I am also preparing a message about friendships for a retreat I am doing in April. That's often what He does, calls me to teach a message He wants me to learn again, and live out in a very new and real way. I had an event on the night of my birthday in Charleston, SC. So I went early to spend a day with my dear friend Margaret. We met years ago when she invited m e to speak at her women’s conference and we’ve been friends ever since. Spending my birthday with her was so much fun, but as Friday's post explains, having this much fun was a surprise because I had started out so homesick. Here we're having dinner at The Queen Anne's Revenge on Daniel Island Sunday night. We slept in for my birthday (Monday), got ready at a leisurely pace and headed to the church where I’d be speaking that night to do some set-up. That's when we spotted Starbucks!! 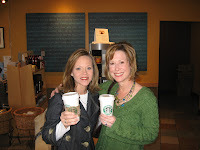 Here I am with my all time favorite – a Cinnamon Dolce Skinny Latte. Our barista took our photo, but before he did, I said, “Hold on, I’ve got to make sure my white shirt under my sweater isn’t showing.” He said, “It’s okay, it’s not showing…I’m looking.” I’m like –You're looking? I know you did not just tell me you are looking at my v-neck to see that my shirt is not showing. We both blushed. Maybe it was my beautiful necklace he couldn’t take his eyes off. Margaret surprised me with it and matching earrings to go with the sweater I had brought to wear that day. Love it! We also browsed Steinmart near the Starbucks looking for this cute jacket Margaret was wearing that I just had to have!! They didn’t have any at that store, but when I got back to Charlotte on Tuesday, I went to our Steinmart and found the only one left, in my size and I had a 20% off birthday coupon!!! 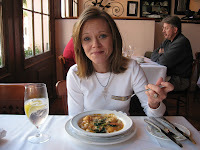 After Steinmart we headed to downtown Charleston for lunch at the famous Magnolia’s restaurant where we had pimento cheese hush puppies, shrimp and scallops, country fried steak and fried artichoke hearts. 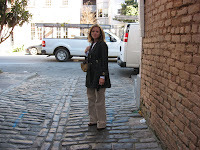 Then we walked through the market and down Meeting Street, brow sed the sales racks at Banana Republic. (We both got a sweater for $25 – originally $68. But when I got home I returned it for a new size and it was marked down to $15! Love birthday bargains.) We were getting sluggish so we popped into you know where, Starbucks for an afternoon Frappacino. Well, it was right there next to BR, so we had to go in you know. 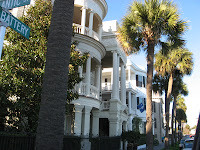 Then we drove down Bay Street and East Battery to see Rainbow Row and a few of the beautiful historic homes on the bay front Afterwards we headed back to our hotel on Daniel Island to rest and get ready for my event that evening. We arrived at Sea Coast Church at 7pm for their Women's Expo - A New Year, A New You! It was an amazing event. I got to meet some new sweet friends and worship God in the power of His presence - connecting our hearts to Him and each other. The glory of His heart was reflected in the gifts and talents of these women and their desire to move into closer community. 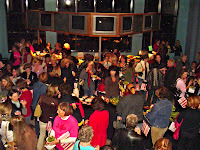 They had 500 women in attendance who flocked to sign up for small groups, the women's retreat and volunteer opportunities. 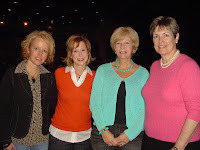 Here I am with some of the leadership teams and women who were so sweet they felt like sister-friends when I left. L-R: Sherry (pastor of programming), Me, Debbie(a friend I knew years ago at a former church who recommended me for the event) and Betsy (women's ministry director.) Notice what I am wearing…same kind of sweater as Jen in first photo. I have minimal fashion sense or time to shop, but who needs to when you can just copy your fashionista friends!? Friendship. It's what I needed for my birthday last week, and what I need more of this year. I needed a day to just have fun, to connect with my friend through laughter, girl-talk and girl-stuff. The funny thing is that God gave me a gift that matched the message He'd also given me to share at Seacoast, about our need to be known and to be loved by friends - and I didn't even realize it until now. I want to ponder this topic a little while. So, I’m looking for some bloggy friends to join me in some girl-talk about friendship. Will you be one of them? I believe every woman’s heart longs for real connections with real friends. I also know it can be a sensitive topic because we've been hurt, rejected or without friends at times. I've been there. I know it's hard when life's too busy for us and our friends, when kids are small and we're balancing family and work. So, let's let’s get real with each other and start some girl-talk about friendships, and make a few new ones here. To make it fun, I am going to do a give-away of something "friend-shippy" like a Starbuck's card, a book and maybe some jewelry later this week. 'Cause I know girlfriends love to win free stuff! Please post your own thoughts about women's friendships, or answer one of these questions…. Do you stay connected with your friends? If so, how? If not, what do you think are the greatest obstacles for women to have good friendships? Simply click the word "comments" below - and be sure to leave your email or come back this week to see if you're the winner and to keep this girl-talk going. See you soon! Lord, what’s wrong with me? 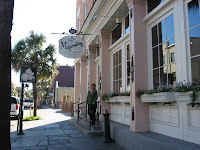 What woman wouldn’t love to go to Charleston, SC for her birthday? 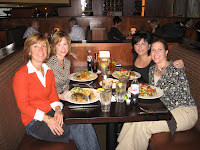 I love spending time with my friends, shopping and eating Low Country cuisine. Why does my heart feel sad about leaving home for a few days? I talked to God and myself as I walked down the airport corridor trying to find my gate. I’d be leaving in 45 minutes and landing in another 45 in Charleston. I hadn’t been able to get enough hugs from JJ and the boys when they dropped me off. Funny how every time they squeezed me, my stomach felt a little better. It was Sunday afternoon and my friend Margaret was driving 5 hours to spend my birthday with me the next day and attend an event I was speaking at Monday night. We’d go out for dinner Sunday night and then stay up late reading magazines and talking about fashion and Starbucks and how we can get her husband to retire in Charlotte. Then I'd fly back Tuesday afternoon. Sounds like fun, huh? My mind said “yes,” but my heart wanted to stay home with my family. Then I felt guilty for all the moms who'd read about my heartache on my blog, and secretly wanted to slap me because they would move mountains for this kind of get-away. Finally I begged God to help me understand why I was feeling this way. Was I just wanting what I didn’t have, or not wanting what I did have? Please tell me you have these kind of conversations with yourself. If I were not going, I’d probably wish I were! Was I just being discontent? Discontent...that is the word that unraveled God’s answer. For years I had prayed He would help me be content as a mom and a wife. When our kids were younger I had a hard time staying home. I wanted to be going and doing. I didn’t want to be home cleaning and cooking and being a mom who never got any appreciation. Home was a hard place for me to be, and it wasn’t just because life was monotonous. When I was growing up, my home was not a haven. It was unpredictable and chaotic at times. My parents were divorced and my mom had to work a lot to make ends meet. When she got remarried, my step father wanted her to spend the weekends with him. 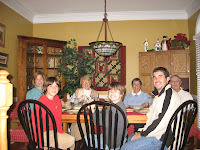 It never really felt like family and rarely was everyone home together. So I spent most of my time as a teen working at the mall, hanging out at my friends houses or spending time at my boyfriend’s house, with his family. My heart learned to detach from home and find a place of belonging somewhere else. I recognized the same pattern in my heart once I got married and we had kids. Even though I finally had a family, I didn’t know how to be a family. My natural instinct was to want to be off doing something with someone else. Once I realized what was happening, I started asking God to change my desires and give me a love for being home. A satisfaction in the sweet smell of fresh laundry and sweaty boys, and dirty dogs and a flannel lovin’ Hokie husband. This weekend while I was away, I realized my heart was sad because God had answered that prayer years ago and even more so that I had asked or imagined. He's given me an abiding contentment in what I have at home. Instead of wanting to leave, it's where my heart longs to be. But sometimes He asks me to give it up and go; to move away from what is now most comfortable; to find my heart's comfort in Him...and to bring His comfort to others through my speaking ministry. I am learning that only Jesus can bring the contentment I long for. Only He can change the desires of my heart to match His. And more than anything, He wants my heart to be at home with HIM, wherever that may be. 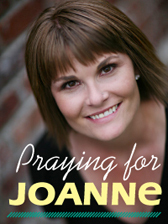 If you are visiting my blog from P31 devotions, thanks for stopping by. I hope you'll come back often and ponder with me the everyday adventures of God's grace where He helps us see beyond who we are - to who we can become - in Him. Post a comment below and tell me, do you ever have this back and forth pull on your heart? Are there areas in your life that God has given you contentment you never had before? Or areas I can pray for you today, that He'd bring His peace? I'd love to hear about them. To post a comment, just click on the word "comments" below. I just got back to my hotel room after an amazing event at SeaCoast Church. Wow, God's presence was so powerful. What a birthday gift that my Heavenly Daddy would invite me to spend the day in Charleston with Him, my sweet friend Margaret and the wonderful women I got to meet tonight. Really, it was such great day! I got over my homesickness the minute my plane took off! Thanks for your prayers. I can't wait to tell you more. But for now, I want to share with you something God gave me this week to weave in to the message for tonight. I talked about our deep desire to be known and to be loved and yet how we fear that if someone really gets to know us(our faults, failures or regrets)they may never love us. My message included a short teaching on the woman at the well (my favorite Bible story) and how her deepest longing was to be known and to be loved. That day when she came to KNOW Jesus and was known by HIM in the most intimate way, she was loved more deeply than she ever imagined. In being known and loved by HIM, others came to know Him through her. I've always wondered what she might have been thinking that day. This clip gives us a glimpse into her heart. I have the words below it in case you want to read them as you listen. I found this clip on Sermon Spice and bought the rights to show it at my event. Then I found it on God Tube and they had the html code available so I could load it on my blog. I hope it impacts you as deeply as it did me. I'm sitting here listening to this song and soaking in God's promise to be with me. I love knowing that the very One who created me never leaves my side; He is with me while I sit in my favorite chair in my bedroom. I've been thinking about my morning with my guys. They took me out for coffee at Starbucks and breakfast at Panera Bread for an early birthday treat. I'll be 41 on Monday. We laughed as we talked about some funny things that happened this week. It was picture a perfect morning! Now I'm feeling sad about not being with them for a few days. I fly out tomorrow afternoon to speak in Charleston, SC on Monday. I am going a day early to spend my birthday shopping with my friend, Margaret, who is going to meet me there. We are going to sleep in late, have lunch and go to the market. It sounded fun when I planned it and I know it will be, but I always get homesick right before I leave for an event. I hate that feeling. I'd treasure your prayers as I prepare my heart and He prepares the women's hearts for the message He's going share through me. I'll speak Monday night and then fly back Tuesday. Okay, so I am going to focus on something God just reminded me of...I get to stretch out my birthday a few extra days because when I get back we'll go out for my birthday dinner Tuesday night! Well, if you're feeling like me today and just need a reminder, here is my wish for you: no matter where you are or what you are going through today, tell your heart: "He is here with me." That is the best gift for any day! Earlier this week when I was feeling down and doubtful, I decided to do something to make me feel better. I wanted to take the emotions that were making me feel like a failure as a speaker and pour them into my most important ministry - being a wife and a mom. So, I tackled a project I know I can do well. I marched into my laundry room and folded towels, socks and shirts of those I love. Brilliant, huh? It may sound crazy, but it made me feel better to do something physical, and something that would bless those I love. I guess it helped me to stop thinking about the words of the one who had not "shown me some love" in her criticism. When I finished the laundry, I knew I needed a challenge so I took on something that is not my strength - the kitchen! You should probably know that I'm not really fond of cooking. I feel terrible when my kids or JJ ask, "What's for dinner?" and I don't have an answer. On this day, being a P31 homemaker was my banner and meal planning was my quest. So, I got out a piece of paper and planned a great menu for the week. Then I went online and ordered groceries and displayed our menu on the family calendar that hangs on the refrigerator. I knew JJ and the boys would love to see what they could anticipate for dinner each night. I was feeling so successful. Who cares if I am not a good speaker? I thought. I may be the next Rachel Ray! Actually, I had to consult Ms. Rachel Ray because I did not know what type of roast to buy. I didn't want the stringy kind. I think that is pot roast. So I did a search on her website, but I couldn't find an answer. I decided to take a risk and buy what sounded good - a sirloin tip roast. Monday: Grilled BBQ chicken, rice pilaf and a veggie. All was going well until this morning when I got the roast out to put in the crock pot. It had strings tied around it's waist. It was so weird. I didn't know whether to keep them on or cut them off. I thought about calling my friend who Lysa affectionately calls gourmet, but I needed to get to work. So, I cut the strings off and hoped for the best. I put the roast in the crock pot with beef broth, a packet of McCormicK Peppercorn Garlic seasoning, a little water and set it on low. It cooked for 9 hours and oh my did our house smell great when we all got home!!! And it was delish!!! I was still a little worried about the strings so I talked to the P31 girls at the office. Wendy P. explained that they are for aesthetic purposes to make the roast look better in the packaging. I surmised that it's kinda like those Spanks we wear to make us look better in our packaging. I love the simple pleasures in life that I take for granted. I love how God can heal my hurts through laundry and menus. I love the sweet scent of His love that surround me this week through the encouragement of friends like you. Thank you so much for your prayers, your perspectives and for taking the time to write me sweet notes and tell me how God has used this very ordinary woman to draw you close to His heart. I love that He knows just what I need when I need it. Be blessed my friends, you have blessed me this week! Somebody really, really hurt my feelings this week. They said a few critical things about me as a speaker. I found out Sunday evening right before I went to bed, and I let it get to me. I woke up all through the night feeling like I'd had a bad dream. In the morning I felt like I never wanted to speak again. It continued throughout Monday. While I was talking to God about it, and trying to get His perspective, it dawned on me that criticism is like a bee sting and doubt is it's poison. When someone criticizes me as a mom, I doubt myself as a mom. When someone criticizes me as a friend, I doubt my ability to be a good friend. And when one person criticizes me as a speaker I begin to doubt my calling - or at least want to run from it. I let the poison of doubt discourage me for 24 hours. Then I called a friend who oh so wisely told me: "Renee, you will never be perfect. And if you ever get to a point where you are, you will be in the wrong calling." Who made that rule? Why can't I be perfect? It's what I've been working towards for over 40 years now. Well, not really, but I do want everyone to like me. I want to be without flaw. I want to be protected from the sting of others' disapproval. The same day my wise old-owl friend told me I'm not perfect, my sister-in-love sent me a photo of me singing "Nobody's Perfect" in the Hannah Montana wig I gave my niece for Christmas. Aren't we beautiful? God's timing is perfect and I love His sense of humor. Now I've been singing that song, and it's helping. Hannah's got a good point - nobody's perfect. I think we all need to do the Hannah jig and maybe get a wig (Target $10). Click the arrow below to sing along. And if you want the words to post on your refrigerator, here they are. I apologize in advance that you may be singing them in your head all day. After singing and praying, I am feeling much better. I finally tucked myself into God's arms and His Truth. I knew that only He could take the stinger out and replace my doubt with hope. He reminded me that even Jesus, the only perfect One to walk this earth, was not liked by everyone. He was constantly accused, criticized and at the center of others' disapproval. I am in good company in my imperfection. I once read that "Life is what happens when you're making other plans." I couldn't have described it any better this week. Wednesday I worked from home. That's my normal routine so I can combine homemaking with P31 computer work and get more done in both areas. I had planned to do laundry, take down Christmas decorations, check emails, make a few calls, review some of my messages for next month and order groceries on-line. After dropping the kids off at school, I headed home, threw a load of laundry in, folded some clothes, and turned on my laptop to check on our new website. Some links weren't working from our radio and devotions blogs so I worked on those. Then the office called. Emails came. My focus was redirected, new questions needed to be answered, new decisions needed to be made and somewhere in there I lost track of time. I remember a few trips to the laundry room but I never made it out of the kitchen area. Hours later I glanced at the clock and noticed is was 2:30pm. Andrew would be home in 30 minutes and I hadn't had lunch, nor breakfast for that matter. The microwave was beeping from my last coffee warm-up, and I was still in my sweats/pajamas. The day was done and I hadn't gotten much done. Well, at least not what I had planned. Christmas decorations were still hung, we still needed groceries and the messages I planned to work on hadn't been touched. Although some very important and time-sensitive things were now taken care of, I felt anxiety coming upon me. I decided to call JJ and let him know we were having leftovers and I'd need his help enlisting the boys to take down Christmas with me that night. He agreed and all was well with my soul. I assured myself that Thursday would go as planned. But it didn't. Instead of a being part of an important conference-call for She Speaks on Thursday, my head was in a notebook for two hours looking for 22 radio shows to re-air in our next volume (that was due last week) . It took much longer than I expected but I had to get it done because we didn't have enough new shows to run since we couldn't do full recording sessions in December due to holiday schedules. The stress must have been apparent for my co-workers kept asking me if I was okay. It ended up being a longer day than planned. Then Friday came and instead of my plans, I once again discovered God's. He assigned me with the sweet companionship of a sweet little 4 year-old named Matthew whose mom (my next door neighbor) just started chemo and felt really sick. A friend called to tell me how sick she was and I got the blessing of being there for her. I had been praying for ways to serve Kim. So, instead of returning calls and volunteering in Andrew's classroom that morning, I got to play with moon sand and trucks, watch Thomas the Train videos and search my attic for forgotten little-boy toys. I loved every minute of it. Although I really like it when my days go as planned, I want my life to be defined by what God has planned. I've begun to see the unexpected not as interruptions but as divine invitations to go where He is. I especially love verse three in the amplified version. The word discern is translated "to sift and search out". I wonder if God sifts my plans and searches out who and what will come along in my day. I can see how He might have redirected my path according to the plans He had for me and others. He knows me better than I know myself. He knows what's coming tomorrow, next week and even next month, so He knows when I need to rise (from the kitchen table) or stay (at home) or go (to the office) and even when I need to do some lying down. Which is right about now. It's late and we've got big plans for tomorrow. Yet I'll just wait to see how He determines just how those will go. My hands and my plans are wide open! So, how are your plans going this week? Okay, I know it's a new year, but I am not over Christmas yet. I got a late start so our tree is still glowing in the corner and memories still twinkle like little lights in my mind. While we were taking down Christmas decorations last night, Joshua asked if we could keep the tree up just a little longer. Andrew's birthday is this weekend so we decided to keep it up until Saturday morning since I don't want a Christmas tree in his birthday party photos. We'll start the process tomorrow, but before we do I have a few memories to ponder in my heart and treasure just a little longer. As I shared in another post, I am a "white-lights-kind-of-girl" and only have white lights on our tree downstairs and colored lights on a smaller tree upstairs. 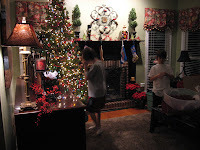 This year I surprised the boys and put colored lights with the white lights on our main tree. Then I called them down to decorate it. They were shocked and so thrilled! I wish you could see their expression. I have to admit, it's the prettiest tree we've ever had. We start Christmas with a special breakfast. Andrew lit the candle clipped to his plate and told Jesus what he wanted to give to Him He said he wants to be more patient, especially with his brother. 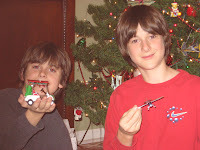 Andrew thanked Joshua for being nice to him that morning, and told him he wanted them to have a good day, and he was going to try really hard to be patient. This was big because they were sick of each other the day before and had gotten into a big fight. Andrew's gift was the best of the day - to God and to his mom and dad!! The boys talked me into getting these hats and now I like them as much as they do. I could not believe they both posed for me. They usually run from the camera. 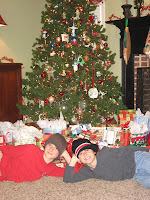 They were so grown up this year and in such a playful mood. JJ's parents drove up from Florida Christmas day and arrived just in time for Christmas dinner. We had a great time together laughing and reminiscing. 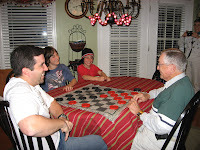 The guys also played a serious game of checkers. Three generations of Swopers, there's nothing like 'em! 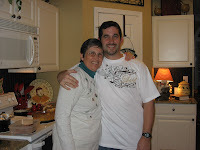 And here is JJ with his mom. What a treasure she is! 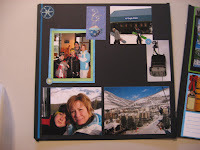 Tomorrow afternoon I'll be posting photos on our family blog of our ski trip to Vail. I know some of you have been waiting (and pestering me) for those. Thanks for your patience and persistence. I can't wait to share them with you! 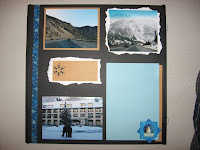 I got out of my creative funk and completed fourteen pages in my scrapbook! Whooo, hooo. It took all of Sunday afternoon to sort them, determine which photos I still needed, order missing photos online from Walmart, decide what type of book and layouts to use and then get my creative juices going. At one point Joshua walked in and asked what I was doing since my photos were still laying on the table in the same places he saw them hours before. I told him I was overwhelmed and asked him to pray for me. Nancy felt bad for my anguish, so she came over to my table, gave me a few suggestions and voila! I started. I just needed someone to tell me what to do. (Thanks Nancy!!!) I had forgotten how to do it, which was strange and frustrating since I used to LOVE to scrapbook. It is a huge creative outlet for me. Well, that night I got these two pages done before going to bed at midnight. I picked up more photos at WalMart Monday and started working on my pages again after lunch. I got another 12 done yesterday!!! Fourteen all-together!!! I am so excited. Thanks so much for your suggestions and encouragement. I decided to stick with a traditional scrapbook since I needed as many pages as possible to do an album with of the trips we took this year as a part of ministry. We would never travel like we dd if God had not called us to a speaking ministry. It can be a very hard calling at times, but these trips have been sweet blessings that allowed us to see places we'd never see and spend time together that makes the perfect recipe for family bonding! 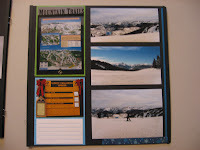 Left page: Our first day on the slopes. Here we are in the ski shop ready to go (notice what I am holding :->), then there's the Gondola (enclosed heated ski lift! ), Joshua and I riding on the Gondola and taking a photos of ourselves after a long run on the slopes, and then the view we could see from the Gondola. Right page: A map of the slopes (it took us the whole first day to figure out how to get around. So many slopes! ), then there's a list of the rules and how many people broke them in the past week/month, and then three shots from the top of the mountain. It was breathtaking. My family got a bit frustrated at one point because I kept taking photos and they wanted to ski. But I wanted to capture this amazing moment that was like being in Heaven for me. Truly the mountains declared HIS GLORY!!! Just in case you are trying to make a decision about the type of album to use in the future, one factor for me was that vacation photos are easier to be creative with since they have themes like snow skiing, beach, pool, camping, amusement park, family reunions, etc. 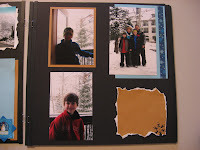 I love the Picfolio, and it does allow for creativity and journaling. It's just limited in pages and doesn't have as much room for design. I may use one to catch up on everyday family photos. Well, we just got back home from our New Years road-trip. The laundry is going, dinner is on the stove and I am headed upstairs to clean out my scrapbooking area that has become a catch-all for junk in our bonus room. Then I am going to get back on my creative band waggon. I gotta stay on it, or I might not get going again. If you'd like to hear the God-story behind our trip to Vail, visit our family blog later this week. I'll be posting photos and my journaling there on Friday. This was an event that I declined initially because my schedule was so full. I had no idea where it was located but I just didn't want to leave my family again after being gone that same week. Weeks later I felt God prompting me to reconsider and see how He wanted to bless us. And boy did He!! PS. Our Proverbs 31 radio show on Monday is about "Capturing This Year" - click on the title to read the transcript, listen to the show and get some great verses for faithbooking.